If you know me, you know I am always checking out the latest trends in natural hair. I have seen so many creative styles in the past year; everything from fabulous color to bold cuts. I recently went back to my tapered cut and I have been hearing from my stylist that more and more people are coming in and requesting tapered cuts. It seems that this season tapered cuts and protective styling is huge! When it comes to my own tapered cut, I prefer defined, soft and fluffy curls. I recently had the opportunity to try Dove Pure Care Dry Oil Collection, which is made to create silky hair without being weighed down. The collection includes Dove Pure Care Dry Oil Shampoo, Dove Pure Care Dry Oil Conditioner, and Dove Pure Care Dry Oil Nourishing Treatment. I enjoyed that there was an entire line to use with this collection. The conditioner and treatment oil were my favorites. The conditioner smelled great and left my hair feeling soft and moisturized. My hair the next morning after being untwisted was beautiful, curly and lightweight. I loved the sheen on my hair. *If you are not completely satisfied with the Dove Advanced Hair Series Pure Care Dry Oil system Dove will refund the purchase. Visit hairmoneyback.com for details. 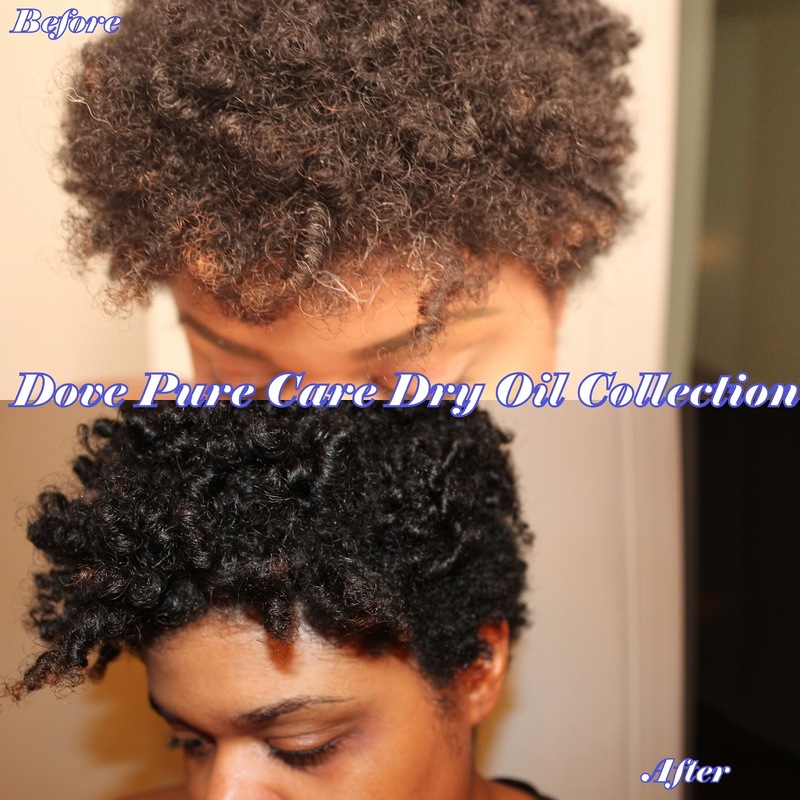 Have you seen Dove Pure Care Dry Oil Collection in stores? Would you give the collection a try? Uh oh, more products that will work on natural hair. Somebody stop me. I use quite a few Dove products. I'm gonna check this one out. Finding oil-based products that don't leave a 'greasy' feeling is like searching for the Holy Grail these days. Thanks for sharing! What a difference! I'm using Mizani currently and it's been working, but with Dove's price point, ya girl' may be doing a switch! Thanks! Your hair looks great. I want to try the hair oil. I like having the sheen that grease gives you, but it does weigh my hair down. This sounds perfect. Your hair looks very moisturized and healthy. My sisters and I love Dove products. Thanks Sonya! The hair oil is very light and gives great shine. I think you would like it! You got that right! Thanks for stopping by Susan! Your curls are poppin'! I need to go back to using Dove's hair products. Thanks! I really didn't know so many naturalistas use Dove's products. So many ladies have told me how they love Dove! Fabulous results! I might give this a try. My hair is super curly and blowing it out and straightening everyday certainly take their toll. Plus I love Dove products and their beauty message!